A week and a bit ago me, my better half and a bunch of mates were lapping up the snow, sun and scarlet vino up in the French Alps on a skiing sojourn. As I was defying all expectations and not falling over at every parallel attempt my phone was busy sending me unwelcome tweets every minute. Apart from the many 2012 season Formula One car launches I had little interest in any of them until I realised that this was the week of the Pattaya Open on the WTA circuit. Who was the defending champ this year? 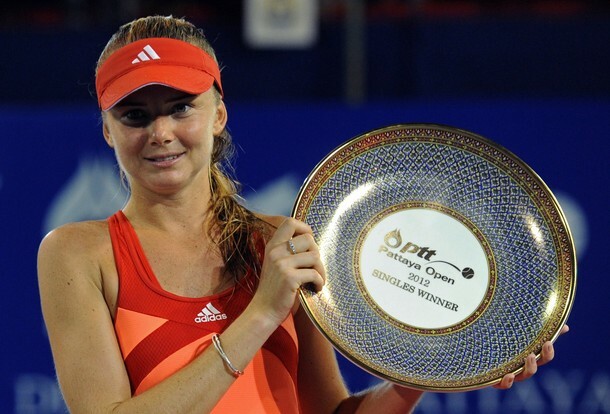 Why none other than perennial underachiever and (un)officially THE most frustratingly inconsistent yet irresistible tennis players to ever grace the game – Daniela Hantuchova. Fearing the worst (always wise with this one) I would cautiously check each update from Thailand with every sip of cheap plonk and wedge of Reblochon. But to my constant surprise and delight, the Slovak continued to sythe her way through an admittedly less than stellar field to the final (no Zvonareva’s to tackle this year) without dropping a set. Upon my return to warmer yet still white-ish UK it seemed my kiss of death was back in full swing. For as I sat to observe the live scoring on Sunday it was business as usual, a topsy turvy match with numerous momentum shifts. Maria Kirilenko had clawed her way back from certain defeat admirably throughout the week but couldn’t deny an uncharacteristically steely Hantuchova who prevailed 6-7(4), 6-3, 6-3 in over three hours! Sighs of relief are joined once again with a desperate hope that title number five offers some momentum for a few more titles and a return to flirtations with the top 10 rankings.